Childhood cataract accounts for 7.4%–15.3% of childhood blindness and a significant amount of avertable disability-adjusted life years. There was no difference in the prevalence based on laterality or gender. India has a burden of around 280,000–320,000 visually impaired children. Preoperative factors play a major role in the postoperative outcomes in children. The age of onset, type of cataract, laterality, delay in presentation, best-corrected distance visual acuity (VA), the presence of strabismus, nystagmus, and glaucoma are all predictors of postoperative visual outcomes in children. The delay in presentation to hospital for surgery is associated with poor outcomes. Congenital cataract operated <1 year of age has the increased risk of postoperative visual axis opacification. Bilateral cataract has better visual outcome than unilateral cataract; 78% of the children with bilateral cataract had more than 0.3 VA.
Age at which an intraocular lens (IOL) can be implanted is a controversial issue. Implanting an IOL in very young children carries the risk of severe postoperative inflammation, posterior capsule opacification, and secondary glaucoma that may need other surgeries. Accuracy of the calculated IOL power is affected by the short eyes and the steep keratometric values at this age. Furthermore, choosing an appropriate IOL power is not a straightforward decision as future growth of the eye affects the axial length and keratometry readings which may result in an unexpected refractive error as children age. Now, the generally accepted norm is to implant IOLs during primary surgery in children 1 year and above. However, there are very few studies that have documented the implantation and subsequent results of multifocal IOLs. The study aims at understanding the merits and demerits of implanting a multifocal IOL after cataract extraction in the pediatric group. This study analyses the visual improvement attained by the child after surgery, the behavior of lens inside the eye, the reaction of eye after surgery, and possible complications. It also assesses the visual performance of the child in photopic and scotopic condition, in day-to-day life. All children requiring primary or secondary IOL implantation where the IOL could be placed in the capsular bag were assigned to this prospective study. 21 eyes of 14 children who developed cataract were included in the study. The ethical standards outlined by the Medical Research Council were followed when contacting patients. A well-informed consent was taken from the patients' parents, and the study protocol was approved by the ethics committee. The cause for cataract, laterality, preoperative and postoperative uncorrected and corrected distance and near VA, axial length, slit-lamp observations, intraocular pressures, age of surgery, type of surgery, postoperative IOL positioning and IOL glistening, intra and postoperative complications, and quality of life estimation were recorded. All patients were followed up for a minimum of 11 months postsurgery. All children were advised to undergo part-time occlusion of the normal eye in case of unilateral cataracts and alternate eyes in case of bilateral cataracts, the time period for each eye depending on resistance to occlusion in preverbal children and based on VA in older ones. VA was assessed by Snellen's chart in older children, LEA symbol chart in preschool children, and preferential looking with grating cards in preverbal children. Near vision was assessed in verbal children. Contrast sensitivity was assessed by Pelli Robson contrast sensitivity chart for verbal children. Stereopsis was assessed by Lang's stereopsis chart in verbal children. In younger children, ultrasound biometry under ketamine sedation was done, and SRK II formula was used for IOL power calculation. In older children, optical biometry was done as an OP procedure, and Barrett's Universal II formula was used. Children of 5 years and more were implanted the same IOL power as calculated. In children <5 years of age, the eye was undercorrected by 10%. All except 3 eyes underwent primary IOL implantation under general anesthesia. Bilateral cataract patients underwent cataract extraction in both eyes simultaneously with IOL implantation. Under sterile precautions, superior 3 mm scleral incision and sclerocorneal tunnel were made. Paracenteses were made at 9.30 O'clock and 2.30 O'clock positions. After staining the anterior capsule with Trypan blue, anterior continuous curvilinear capsulorhexis was done with a rhexis forceps, the pull directed centrally. Lens was aspirated with an irrigation–aspiration handpiece. Posterior continuous curvilinear capsulorhexis along with anterior vitrectomy was done. A single-piece hydrophobic acrylic multifocal IOL was inserted into the capsular bag. The remaining viscoelastic substance in anterior chamber (AC) was washed off, and the corneal incisions were sutured after a peripheral iridectomy. Posterior continuous curvilinear capsulorhexis and anterior vitrectomy were done in all except 4 eyes. Surgical peripheral iridectomy (PI) was done in all cases. The multifocal IOL used were MF Restor with add of + 3D and Tecnis MF with add of + 4D for near vision correction. Postoperative IOL positioning was evaluated with respect to the number of rings exposed on either side of the IOL center in the pupillary area. The presence of IOL glistening on slit-lamp examination was noted. Slit-lamp examination was done using either the handheld or standard slit-lamp microscope. For assessing the quality of life after cataract surgery, a questionnaire was prepared which enquires about the performance of the child during daytime and at night, whether having difficulty in grasping objects, in identifying faces, reading books and distance signs, and navigating familiar and unfamiliar areas in low light conditions, the child's interest in books and pictures, etc. 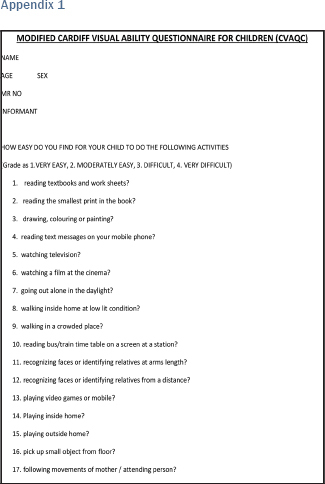 It was modified Cardiff Visual Ability Questionnaire for Children [Appendix 1]. SPSS ver 21 was used for data analysis, and the outcomes were documented. Twenty-one eyes of 14 pediatric patients were included in this study. 7 of them underwent bilateral surgery. The average axial length was 22.53 mm, ranging between 20.2 mm and 26.87 mm with a standard deviation of 1.74. The average age at which IOL implantation was done was 5.19 years, ranging from 1 to 14 years [Figure 1]. All except 3 underwent primary IOL implantation. The average MFIOL power was 23.07 D ± 4.09 D. The lowest power implanted was 14.5 D in a 14-year-old child. The logMAR best-corrected VA for distance and near (courtesy: David B, Elliott and John G Flanagan. Assessment of visual function. Ophthalmology, published on 08/03/2015) improved in 100% of eyes. The average corrected distant VA was 0.3 (6/12) and average near vision was 0.38 (N6–N8) without near addition [Table 1] and [Table 2]. 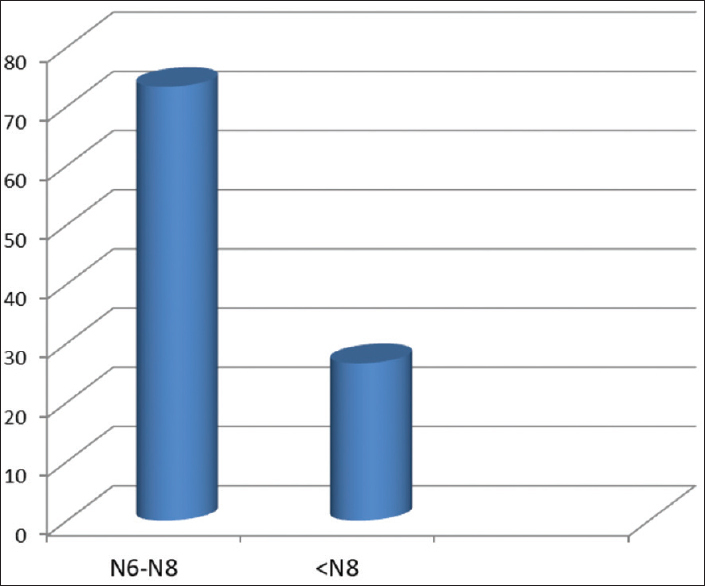 About 66.7% cases had postsurgery uncorrected distant vision of 6/12 or better, and 73.3% had uncorrected near vision of N8 or better (verbal children) [Figure 2] and [Figure 3]. The average residual spherical power was 0.26 DS, and astigmatism was −0.22 DC. The age at which IOL implantation was done and the percentage of improvement of vision in each eye were studied, and the correlation between the two was analyzed. However, no correlation was noted between the two [Table 3]. No intraoperative complications occurred in any of the cases. IOL decentration was noted in none of the cases at follow-up visits. There was transient rise in IOP in 9 eyes immediately postsurgery but became normal within 1 month. The average IOP at 1 month was 13.71 mmHg. Three cases developed visual axis opacification and underwent Nd: YAG capsulotomy at an average of 5 months postsurgery [Figure 4]. The quality of life questionnaire indicated excellent levels of performance at school and play and in both photopic and scotopic light conditions. There was no indication of intolerance to light or poorer performances in low light situations. The average postsurgery contrast sensitivity noted in verbal children was 1.5. Stereopsis was attained in all verbal children(600–40 s of arc). The visual prognosis for children with congenital cataracts has improved dramatically since it was first recognized that cataract surgery during infancy is critical for a good visual outcome;, however, the optimal time to perform cataract surgery in a child with a congenital cataract is still in question. Anecdotal reports have noted excellent visual outcomes in neonates undergoing cataract surgery during the 1st week of life;, however, a subsequent analysis of 45 children with dense unilateral cataracts, who underwent cataract surgery, found that the visual outcome was the same regardless of when the surgery was performed during the first 6 weeks of life. While the same analysis has not been performed on children with bilateral congenital cataracts, it has been proposed that the critical period for treating children with bilateral congenital cataracts may extend to 8 weeks of life.,, Owing to the giant leap in cataract surgery technology and technique of pediatric cataract surgery, the postsurgery complications are few now. According to Infant Aphakia Treatment Study (IATS), there was no significant difference in VA at age 1 year between those who underwent primary IOL implantation and those who were left aphakic and given contact lens correction although the IATS found a higher number of surgeries in children who had IOLs at <1 year. Despite controversy, IOLs are implanted in infants with increasing frequency. Some have advocated surgery based on age as follows: (1) Infants <6 months to undergo lens aspiration, primary posterior capsulectomy, and anterior vitrectomy. IOL implantation in children <6 months is still controversial. (2) Primary IOL implantation is to be the standard of care in patients over 2 years of age. There is increasing evidence of safety in those <2 years. A survey by the American Association for Pediatric Ophthalmology and Strabismus reported an increase in IOL implantation in children <2 years from 12.9% to 81.9% from 1993 to 2001. Some have advocated implanting IOLs at an even younger age <6 months in cases of unilateral cataract with no contraindications such as microphthalmia or structural abnormality. Ledoux et al. reported a 14-year retrospective review of 239 children (aged 11 days to 17 years), with unilateral and bilateral cataracts who underwent primary IOL implantation. They found approximately 75% achieved 0.3 vision or better and with better outcomes in bilateral cases and in children who were older than 1 year before IOL implantation. In a retrospective study of 400 patients with 87% of the cohort undergoing primary IOL implantation, Congdon et al. reported that 40% achieved 20/60 vision or better. Congdon et al. concluded that IOL implantation with spectacle correction predicted a better visual outcome. A study of primary IOL implantation in 120 eyes of 80 children below 2 years of age concluded that IOLs were safe and can be considered a viable option for visual rehabilitation. We have found that all children increased their VA from an average of 0.8–0.3, including very young and old children. The youngest child to undergo IOL implantation in our study was of 1year of age, as we follow a protocol of aphakia and contact lens use post surgery for children below 1year of age. The oldest child was 14 years of age, and although she underwent surgery beyond the age of plasticity, her vision did improve substantially from 1 to 0.6. This could be because hers might have been a progressive developmental cataract rather than a dense stationery congenital cataract, and so, it would have been less amblyogenic. Multifocal IOLs provide good near and distance vision and also help in establishing stereopsis in unilateral cases, but the brightness and contrast of the images have been reported as getting compromised. Any decentration of lens leads to glare, halos, and deterioration in the quality of the image. Although spectacle independence should not be expected with multifocal IOLs in children, the multifocal IOL provides independence from bifocals and will still be able to provide distance vision correction with refractive surgery in the patients' adult future. Furthermore, as near vision is more important to ward off refractory amblyopia, IOLs which provide good near vision also are likely to be a better option. Jacobi et al. report on their experience implanting multifocal IOLs in 35 eyes of 26 pediatric patients aged 2–14 years. They suggest that for children, multifocal IOLs are a viable alternative to the standard monofocal IOL. However, this study has limitations. The reported benefit of improved stereopsis may come from improved acuity. Data on spectacle dependence and subjective satisfaction are not helpful when obtained from children, who will understate their symptoms in the hope of avoiding glasses. The average follow-up of 27 months (range, 12–58 months) was good for adults but is not sufficient for pediatric patients. Our previous study on implantation of unifocal IOLs in pediatric group studied the prevalence of amblyopia after the unifocal IOL implantation in children in the age group of 1–10 years. 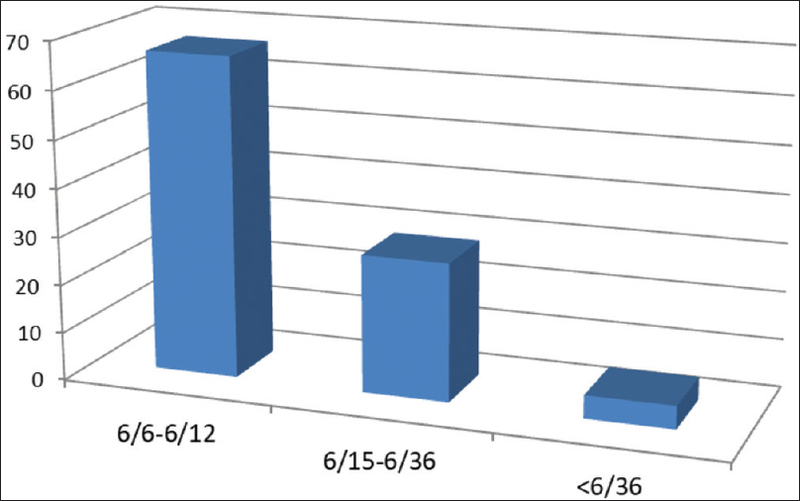 In that study, the average follow-up period was 41 months, but 55.6% of the cases had amblyopia (<6/9). However, in our current study, despite the short follow-up period of 11 months, the prevalence of amblyopia was 47.6%. In our patients, the parents were given a choice of unifocals and multifocals, with the advantage of multifocals being added near VA and no more. They were counseled about additional distance and near glasses also although most children required correction for astigmatism and none required near augmentation. This itself shows that correcting near vision with a multifocal IOL may be a more physiological process for children than giving bifocals. Lee et al. studied the VA and patient satisfaction after implantation of array SA40N multifocal IOL in adult population. Three months postoperatively, UCDVA, UCNVA, UCDVA under glare conditions, and contrast sensitivity were good in all eyes, and more than 72% of patients never wore glasses for near vision. In our study, the good response with respect to contrast assessment is an indication of the tremendous adaptability of children's eyes to light distribution by the IOL and resultant aberration like glare, as even the older children failed to report it when questioned directly. 3 of 21 eyes (14%) developed visual axis opacification though they had already undergone posterior continuous curvilinear capsulorhexis (PCCC). This could be because of inadequate anterior vitrectomy that would have provided a scaffold for lenticular tissue to proliferate. IOP rose only transiently in 9 eyes immediately postsurgery. This could have been because of retained ocular visco-elastic devices (OVDs), steroid response, or an immediate inflammatory response. None of the children had a primary glaucoma, and we were able to achieve normal IOPs after a brief period of treatment of transient glaucoma. None of the patients developed postoperative uveitis inspite of not using systemic steroid. This may be because of refined techniques, intensive topical steroid coverage early, on in the postoperative period, and frequent monitoring. The inadequacy of the study include (1) moderate sample size, (2) difficulty to assess near vision in preverbal children, (3) difficulty in extracting qualitative informations from children regarding abstract phenomena like glare, which are associated with diffractive multifocals, is also an impediment. For children, near vision is very important, oftentimes more than distant vision, especially in younger amblyopia-prone groups. They need clear near vision for their daily activities such as playing and drawing. Smaller children may not be compliant with spectacle use or contact lens use especially when having working parents. Furthermore, children with bifocals need not use the segments optimally, all of which are causes for amblyopia. Multifocal IOL implantation is a better alternative to monofocal IOL for pediatric cataract as the patient does not have to use a bifocal glasses although a distance correction may be needed depending on the residual refractive error, especially in a growing eye. It has been shown that good near vision is essential to overcome the effects of amblyopia, and in this regard, the multifocal IOL prevents the development of amblyopia in such patients, as it acts as an inbuilt amblyopia therapy. It provides reasonable stereopsis and contrast sensitivity. The postoperative complication rate associated with such IOLs was virtually nil. A high degree of visual improvement is obtained. Rahi JS, Sripathi S, Gilbert CE, Foster A. Childhood blindness in India: Causes in 1318 blind school students in nine states. Eye (Lond) 1995;9 (Pt5):545-50. Sheeladevi S, Lawrenson JG, Fielder AR, Suttle CM. Global prevalence of childhood cataract: A systematic review. Eye (Lond) 2016;30:1160-9. Titiyal JS, Pal N, Murthy GV, Gupta SK, Tandon R, Vajpayee RB, et al. Causes and temporal trends of blindness and severe visual impairment in children in schools for the blind in North India. Br J Ophthalmol 2003;87:941-5. Bonaparte LA, Trivedi RH, Ramakrishnan V, Wilson ME. Visual acuity and its predictors after surgery for bilateral cataracts in children. Eye (Lond) 2016;30:1229-33. Beller R, Hoyt CS, Marg E, Odom JV. Good visual function after neonatal surgery for congenital monocular cataracts. Am J Ophthalmol 1981;91:559-65. Gelbart SS, Hoyt CS, Jastrebski G, Marg E. Long-term visual results in bilateral congenital cataracts. Am J Ophthalmol 1982;93:615-21. Gregg FM, Parks MM. Stereopsis after congenital monocular cataract extraction. Am J Ophthalmol 1992;114:314-7. Birch EE, Stager DR. The critical period for surgical treatment of dense congenital unilateral cataract. Invest Ophthalmol Vis Sci 1996;37:1532-8. Lundvall A, Kugelberg U. Outcome after treatment of congenital bilateral cataract. Acta Ophthalmol Scand 2002;80:593-7. Magnusson G, Abrahamsson M, Sjöstrand J. Changes in visual acuity from 4 to 12 years of age in children operated for bilateral congenital cataracts. Br J Ophthalmol 2002;86:1385-9. Infant Aphakia Treatment Study Group, Lambert SR, Buckley EG, Drews-Botsch C, DuBois L, Hartmann E. The infant aphakia treatment study: Design and clinical measures at enrollment. Arch Ophthalmol 2010;128:21-7. Wilson ME, Trivedi RH. Pediatric cataract surgery: Operative and postoperative issues. In: Wilson ME, Saunders RA, Trivedi RH, editors. Pediatric Ophthalmology: Current Thought and a Practical Guide. Ch. 23. Heidelberg, Germany: 2009. p. 326-43. Rao SK, Ravishankar K, Sitalakshmi G, Ng JS, Yu C, Lam DS. Cystoid macular edema after pediatric intraocular lens implantation: Fluorescein angioscopy results and literature review. J Cataract Refract Surg 2001;27:432-6. Fan DS, Yip WW, Yu CB, Rao SK, Lam DS. Updates on the surgical management of paediatric cataract with primary intraocular lens implantation. Ann Acad Med Singapore 2006;35:564-70. Wilson ME Jr., Bartholomew LR, Trivedi RH. Pediatric cataract surgery and intraocular lens implantation: Practice styles and preferences of the 2001 ASCRS and AAPOS memberships. J Cataract Refract Surg 2003;29:1811-20. Ledoux DM, Trivedi RH, Wilson ME Jr., Payne JF. Pediatric cataract extraction with intraocular lens implantation: Visual acuity outcome when measured at age four years and older. J AAPOS 2007;11:218-24. Congdon NG, Ruiz S, Suzuki M, Herrera V. Determinants of pediatric cataract program outcomes and follow-up in a large series in Mexico. J Cataract Refract Surg 2007;33:1775-80. Jacobi PC, Dietlein TS, Konen W. Multifocal intraocular lens implantation in pediatric cataract surgery. Ophthalmology 2001;108:1375-80. Lapid-Gortzak R, van der Meulen IJ, Jellema HM, Mourits MP, Nieuwendaal CP. Seven-year follow-up of unilateral multifocal pseudophakia in a child. Int Ophthalmol 2017;37:267-70. Lee ES, Lee SY, Jeong SY, Moon YS, Chin HS, Cho SJ, et al. Effect of postoperative refractive error on visual acuity and patient satisfaction after implantation of the array multifocal intraocular lens. J Cataract Refract Surg 2005;31:1960-5.